The Cabin and site was accepted to the National Registry of Historic Places in 1976. The site has two historic structures -- the 1856 Baker Cabin sitting on it's original site, and the 1895 Pioneer Church, moved to the site in 1967 from Upper Logan (Springwater). 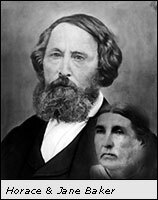 Horace and Jane Baker traveled west from Illinois in the second wagon train from Independence Missouri in 1846. This was the first wagon train to cross the new Barlow Road from The Dalles to Oregon City. The Barlow Trail bypassed the treacherous ride on rafts down the Columbia River. The Bakers chose the area, now known as Carver, for their 640-acre Donation Land Claim due to a basalt rock formation to the west of the cabin. Horace Baker was a stone mason by trade and being a very enterprising man he could envision this area as one of great promise. (The basalt rock is very high grade and 3 - 8 million years old). Soon Horace Baker was very busy quarrying rock from this area. The quarry became a thriving business. At that time the area was known as "Baker's Quarry" and held that name for many years. Horace also ran a slack-line ferry across the Clackamas River where the bridge is now located. This ferry allowed the areas of Springwater, Logan, and Upper Logan to develop. In the area which is now the Carver Boat Ramp the quarried rock was loaded onto barges and during the spring floods was floated six miles down the Clackamas River to Oregon City and distributed from there. Rock from the quarry provided the materials to build the Oregon City Locks, the Tillamook Light House, Portland's Pioneer Post Office, the Portland Hotel (since torn down), and numerous rock walls throughout the Oregon City area. 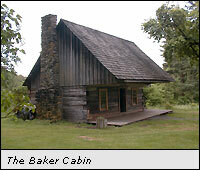 The Bakers lived at the site for ten years prior to building the cabin. Since Horace was occupied with business the story is that neighbors took pity on Jane Hattan and constructed the Cabin out of squared timbers originally destined for the California Gold Mines. The timbers were hand hewn from Douglas Fir logs harvested from the property. There are no records of the temporary dwelling that they used prior to the Cabin's construction. (It was fall of 1846 when they arrived in Oregon, and as most pioneers did, they lived out of their wagon the first year.) No pegs or nails fasten the lap-jointed logs. The cantilevered design is common to the East Coast but seldom seen on the West Coast. The second floor sleeping loft is accessible by the outside stairs. Baker descendants lived in the cabin until 1901. At that time the building was abandoned. Later the area of their land claim became known as "Stone". Named, not after the quarry, but after Livingstone Stone the first superintendent of a fish hatchery located near the confluence of Clear Creek and the Clackamas River. The land for the hatchery was donated by Horace and Jane Baker. This was only the second fish hatchery in the nation, and the first in Oregon. The area of "Stone" was renamed "Carver" after Steven Carver who platted the first development in the area and built a railway to service the town. His hopes for founding a true town fell short of the mark, but the Carver area did develop several businesses including a Creamery, grocery, Elementary school, among others. Horace Baker died in 1882 at the age of 80 and is buried in Mountain View Cemetery, Oregon City. Jane died 16 years later, 79 years old, and is buried in Pleasant View Cemetery, Logan. After the Baker's deaths the Cabin remained mostly vacant except for short periods when family members occupied the site. Additions were built onto the west end of the Cabin and housed the kitchen. However, additions burned down twice and were not rebuilt. Luckily the cabin itself was saved and restored to the present condition by the Old Timers Association. The Association was formed in 1937 to restore the structure. Most of the Association members were direct descendants of the area's pioneers and over the course of several years they repaired the crumbling structure. In 1978 the Old Timers Association was changed to the Baker Cabin Historical Society to better reflect its purpose of restoration and preservation of the historic site. With funding provided through a grant, a major restoration project was completed in 1991. Rotting timbers were replaced, the foundation was restored, windows and door frames renewed, the fireplace rebuilt, and a front porch built. Also on the site is a shed built in the style of the pioneers which houses the antique stage coach called the "Mud Wagon". Built in Ohio the stage served many routes here in the Portland area including the road from Sandy to Portland. This design of wagon was particularly suited to the muddy road conditions of it's day, hence the name. The wagon has been gracefully restored and is on static display. The Baker Cabin Historical Society is a nonprofit, all volunteer association with the aim to preserve and maintain the site as a source of inspiration and education for generations to come. Supported through Society Memberships, plus income from wedding rentals, and various fund-raisers and bazaars, the Association Board meets once a month and sponsors several traditional events throughout the year. Download the Story: "Along the Oregon Trail"
The 1895 German Methodist Church was acquired by the Society 1967. Originally built by a German community in Logan it was abandoned in 1920. It is said that all sermons were preached in German. Slated for demolition, the church was salvaged by a group of community members lead by Ernest Heinrich, who moved it to the Baker Cabin Site. 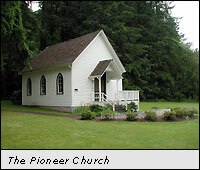 Beautifully restored, the Pioneer Church, in it's tranquil wooded setting, has become a popular site for Weddings and nondenominational Church Services at Easter Sunrise, Thanksgiving, and Christmas. Wedding or Concert rentals are available and help to defray to costs of maintaining the site.